If you had asked me in my first three pregnancies whether I wanted a homebirth, I wouldn't have been able to say no quick enough. I didn't understand the appeal, I felt comforted and safe in a medical environment and giving birth in the hospital was just what people did. This time though, it felt different and I decided very early on that I wanted to this baby at home. I had had three complication free births, one in the labour ward and two in the local midwife unit and so I had a lot of faith in my body and its ability to birth. I brought up the idea at my booking appointment and my thoughts were recorded and throughout the pregnancy it was agreed that I was low risk. It became more of a question when they decided that our baby was very large, but the consultant was happy to sign off on a homebirth and from 37 weeks we were all good to go. I had decided that Sunday night would be a really convenient time to give birth, so the Sunday before my due date I felt a bit restless. I walked into town to pick up some last minute bits and went for a long walk along the esplanade. I watched films sat on my birthing ball but went to bed a bit deflated that nothing was happening. I don't know why I expected it would, but I had got my hopes a bit too high. I woke up on Monday morning around 4am with a mild contraction. I was pretty convinced that it was a contraction rather than a Braxton hicks but it was mild and I dozed on and off the rest of the night waking slightly for some surges but nothing big. I got up at 7:30 and we got the boys ready for school. I asked the bloke to take them as I felt like I wanted to be at home. I spoke to my mum and she offered to take Finn for a few hours so that I could concentrate on what my body was doing. Things were getting stronger but they were still incredibly irregular. I felt confident that this was the start of it all, but I didn't know how long this early labour stage would last. At 10am I rang the hospital to let them know that I was in early labour and whilst I didn't need a midwife yet, I wanted to make sure that everything was still in place and that the midwives were on call. They took my details and I was told a midwife would ring me later. I started tidying up the living room and creating a cosy area with everything I would need for the birth. The midwife rang me at 10:45 and as she was in the area she wanted to come and start the paperwork. She got to me at 11am and typically I didn't have a contraction for the first 20 minutes that she was there. My contractions were incredibly irregular with three in ten minutes followed by a 10 minute break and just all over the place. My body told me to walk though and that is what I did, around the house and up and down the stairs. The midwife took my blood pressure and felt my belly and told me that baby wasn't yet engaged but was head down. At 11:50am she suggested that she go away for a while and come back once I was in established labour. At this point my contractions had really stepped up and whilst they weren't regular in duration or time, I knew that my body works fast. We agreed that she would examine me and her shock was evident when she declared me 4cm. As I have a history of short established labour she decided to stay. She wrote a few notes whilst I got comfy in my birthing space and started on the gas and air. She rang the second midwife to let her know that she had time to finish up her visit but that she should head over soon. Everything suddenly became very familiar- the nausea, the intensity, the doubt in myself and the urge to push. Leaning over the sofa I let my body do what it needed to without me trying. It was at this point that the midwife suddenly grabbed her gloves and apron and put them on as quick as she could. I tried to let my body birth the baby and it did without me really pushing. The waters broke as her head came out and at 12:31pm our little girl arrived. She was passed up through my legs and I sank into the sofa with my baby. She had started crying before her shoulders were born and she was pink and beautiful. We cuddled up on the sofa for some skin to skin and the second midwife and her student arrived. Everything was so calm, the bloke made us all tea and the biscuits came out. I was left to have skin to skin and feed the baby for the first hour with no intervention and then she was weighed and checked over whilst I delivered the placenta. She was much smaller than we were expecting and a healthy 7lb 13oz. Everyone cleared up around me and it wasn't long until the house looked tidier than it had that morning. After two hours the midwives left and it felt so strange and wonderfully to already be in our home. I could take a shower without having to wear flip flops, choose my comfiest clothes and spend as long having skin to skin as we wanted. The bloke left at three to go and collect the big boys from school and nursery and when he came home the baby and I were snuggled on the sofa ready to meet them. 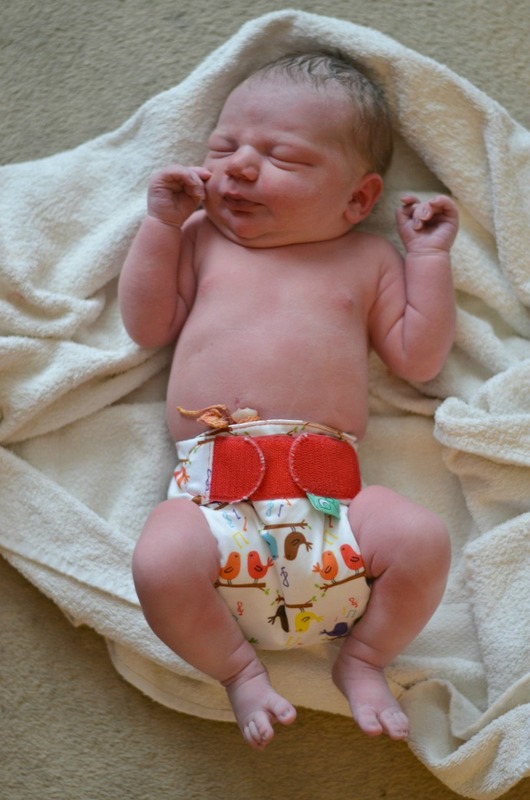 In some ways having a home birth felt like less of a 'big thing' - there was no coming home outfit to plan, no posing with the car seat as we leave the hospital, no big balloons, but it was the perfect decision for us. It was quiet and comfortable and our baby girl was so alert and calm from the beginning - I am wondering whether this is a reflection of her entrance into the world and first hours. We had everything we needed and I could listen to my body completely. 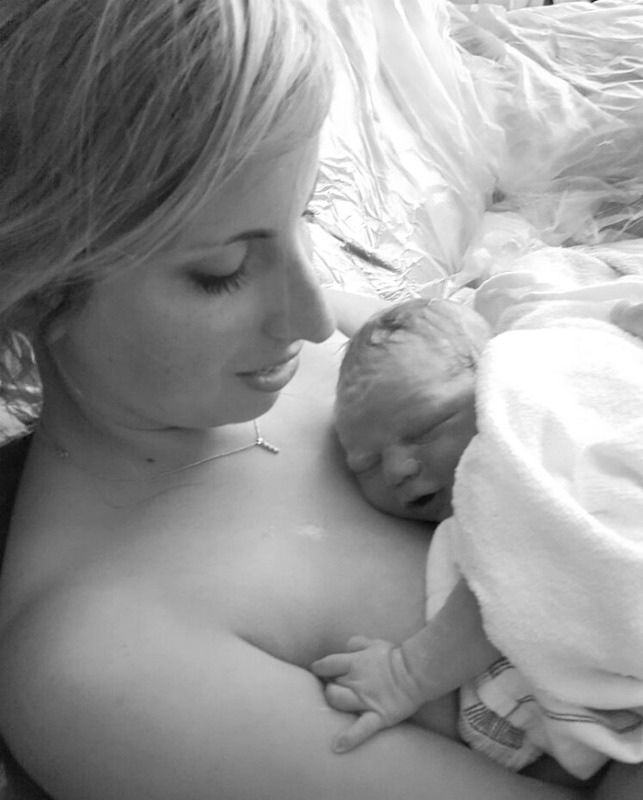 The midwives were respectful of my wishes and birth plan and I felt incredibly supported at every point. Such a lovely birth story, even reading it you can feel how calm everything was. Such a beautiful blog that you will be able to share with her when she is older. It sounds so lovely the stress free home birth. I am sure this will help women who want to give birth at home, but felt unsure if it was for them. Completely get what you mean about home birth somehow feeling like less of an 'event', I really craved the quiet normality I'd had with Rory's birth after 5 days in hospital with Baby O! It sounds like everything went exactly as you wanted it to and Cora is beautiful. I loved my home birth too - not so much the actual giving birth at home (although that was great) but more that fact that once he was here I was at home. I felt so comfortable to be be in my own surroundings instead of in an unfamiliar hospital. I'm so happy for you that you got the birth you wanted too. Sounds like the perfect birth. Well done both of you. And she is just gorgeous. Hope you are all well and am I'm sure the boys are head over heals in love already. Congratulations. She is beautiful and I love the name you chose. Whilst we spoke before about it and you know I'd never want a homebirth for myself because of my medical history, I'm so happy for you that you got yours. I know how much you wanted this and it sounds like it went absolutely perfectly for you. No sign whatsoever of my baby yet. His due date is today. I don't feel like he has any intention of making an appearance yet, I'm still full of energy and blooming. I hope I get the pushing part as easily as yours sounded this time around. Oh how wonderful that it went exactly to plan - it sounds very calm and chilled out and just what you wanted - hopefully it's the sign of a very calm chilled out little girl! Our baby is due in just over a week, so could arrive at anytime. 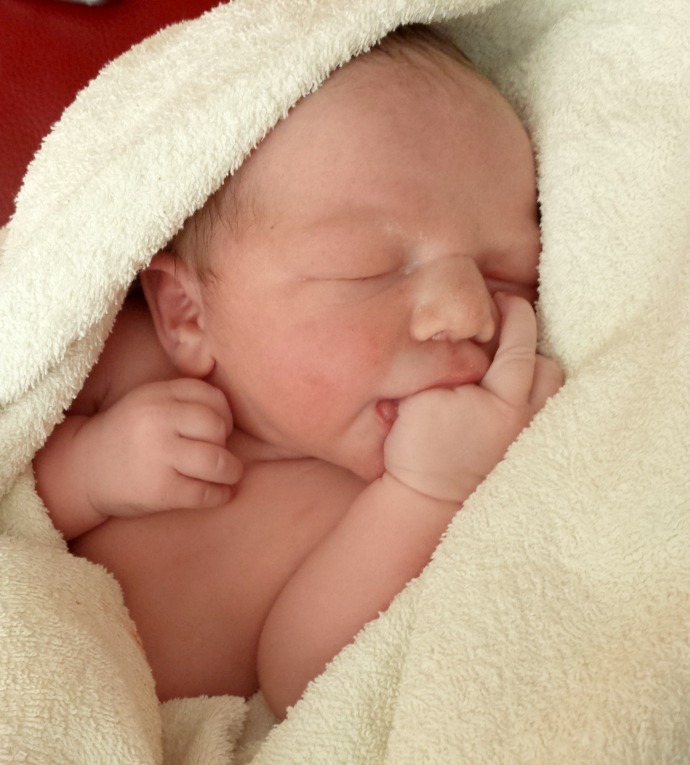 Great to read a happy, positive birth story, thank you.